House of Marley Chant audio system is designed for life on the road | What Hi-Fi? 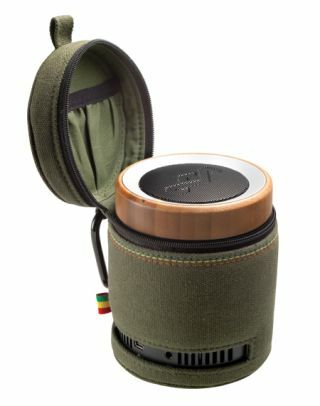 New from the House of Marley is the £50 Chant portable audio system. It's just 15.24cm high by 12.7cm wide and includes a single full-range driver and one passive radiator for bass reinforcement, as well as a rechargeable battery that can be connected and charged via USB. There's a 3.5mm input for connecting portable music devices, and the unit comes in custom-fit canvas sleeve including a carabiner for easy attachment to your backpack or bag. Five per cent of all proceeds from sales of House of Marley products go to 1LOve.org, the organisation founded by the Marley family which supports charities, causes and ideas that can change the world, with a focus on the planet and peace.